In just a few days, the first section of the long-awaited project K-onnection opens. The project comprises two new cable cars running direct from Kaprun to the Maiskogel ski resort and then on to the Langwiedboden station in the Kitzsteinhorn Glacier ski area. This means that you will be able to put on your skis in the centre of Kaprun and take the cable car conveniently all the way to the foot of Kitzsteinhorn. In the evening you can simply ski back down into the valley, straight into the centre of town. 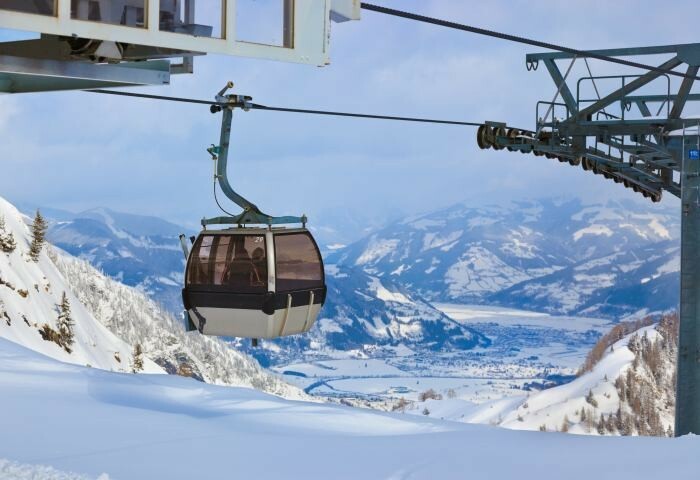 On 14 December, the ten-place Maiskogelbahn cable car starts operating, taking passengers from Kaprun (768 m above sea level) to Maiskogel (1,570 m above sea level). The cable car will transport up to 2,800 persons per hour and the journey will take just 12 minutes. It will run via a new intermediate station, Stanger, which gives access to beginners’ ski slopes and the ski school. At the bottom station you may visit the new Kaprun Center, which houses the ticket office, a sports equipment shop, a rental shop and ski storage for up to 2,000 pairs of skis. The cable car will also be in operation during the summer, so hikers will be able to access signed alpine footpaths more easily. The second section of the project connecting Maiskogel with Kitzsteinhorn by the 3K Kaprun-Kitzsteinhorn-Konnection cableway will be completed in December 2019. The cable way will have a capacity of 2,700 persons per hour and the journey will take 9 minutes. The main focuses of the project was maximum comfort for skiers and the use of state of the art technologies. In practice these new developments mean that you will be able to reach the top station on Kitzsteinhorn at an elevation of 3,029 metres, using six cable cars. This chain of cable cars will be 12 km long. Climbing 2,261 vertical metres, this will make it the largest such route in the Eastern Alps. Thanks to these changes, the glacier centre will be accessible from two different directions – from the bottom station of the Gletscherjet cable car for one-day visitors and from the centre of town for those who are accommodated in a hotel or apartment owners. Kaprun will now be able to guarantee snow cover from October until the spring, which will further improve its reputation as a top destination in the Alps. Of course, this will make it even more attractive for investors. In the autumn of 2019, immediately before the opening of the second cableway, a new apartment project will be completed. The apartments are intended for rental, although owners will be able to use the apartments for several weeks for their own purposes. Their stay will be made more pleasant thanks to the services offered by this complex, such as a restaurant and a wellness centre and swimming pool. A beautiful apartment with a terrace and a garage parking space is on sale in the centre of Kaprun, within easy walking distance from the Maiskogel slopes. Also on sale is an excellently located new apartment in a complex with a wellness and fitness centre. 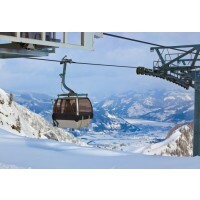 The centre of Kaprun and the newly built cable car is easily accessible on foot. Your car can remain in the adjacent car park for the duration of your visit.